We have written about the hamlet of Loco, situated in the Valley Onsernone, when we spoke about astronaut Walter Schira whose family roots were from there. Today, we would like to describe once again this beautiful valley in order to introduce one of the most wonderful and scenic walks that exist in the Insubrica region. 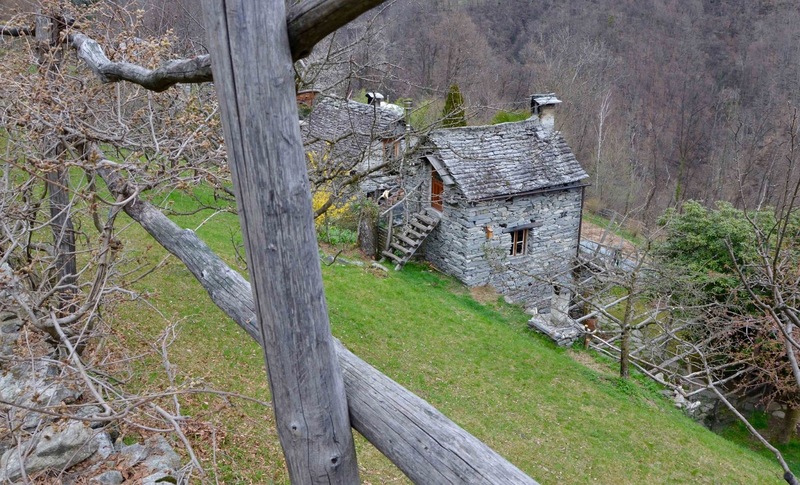 The discovery journey will plunge you into a peasant hard life which has been associated with an ancient mule-track road since the Middle-Ages, called in Ticino the "Via delle Vose". The aim for local peasants was to reach the valley floor, notably the market and the harbour of the town of Locarno. This long way was indeed a principal communication road between the Locarnese region and the Valley Onsernone in the ancient times. The "Via delle Vose" is an indexed road within the Swiss Federal Inventory of Historical traffic routes. It is about 6.5 km long unveiling a remarkable heritage of the region to tourists who are eager to experience the surroundings on foot. 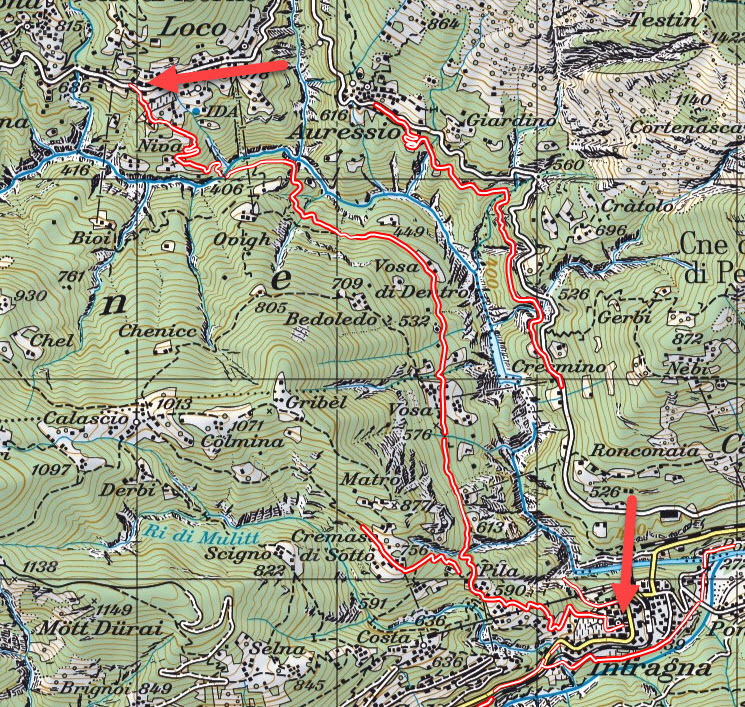 IH suggests to reach the village of Loco (686 masl) in Onsernone as the starting point. It is possible with a postal coach service from Locarno that has hourly departures, stopping right at the beginning of the "Via delle Vose", which is situated in the North of the village Loco. While being in Loco, it is wise to pay a visit to a small local museum called Museo Onsernonese with its ethnographic, historical and artistic collection related to the valley. The initial part of the trek is fairly steep, falling sharply and bringing you to the bottom of the Isorno valley (406 masl) in which the river Isorno flows. The original bridge was completely destroyed by the floods of 1978. It has been replaced in 2016 by a new construction conceived by a well-reputed bridge architect, Ing. Prof. Christian Menn (1927-). 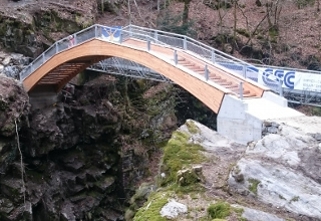 It has recreated the small bridge yet with a great aesthetic appeal that integrates itself perfectly in the wild surroundings of this remote part of the road. Christian Menn is known for having designed bridges all over the world; notably, just to mention few works: the Zakim Bunker Hill Bridge in Boston, Sunniberg Bridge near Klosters/Graubünden and many other bridges in Switzerland and abroad. After having left the brigde, you ascend and cross the small hamlets of Niva and Vosa, walking alongside traditional dry-stone walled terraces and three beautiful chapels that create an ensemble of an old Via Crucis, that are pure testimonials showing to us how this stroll was difficult as a journey in the past. In Niva, above the Isorno river, you can also admire a wine-press from the sixteenth century used to press the grapes. 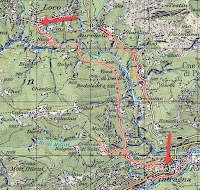 The two hamlets represents also an unique setting for Canton Ticino, since in the late Middle-Age, belonged politically to Losone situated next to Locarno.The hamlets were thus used as a summer pasture land for the peasants of Losone. After Vosa, the path continues alongside of the valley descending toward the hamlet of Pila (590 masl) another beautiful mountain village. You will be surprised by the old school situated at the entrance of the village coming from Loco. Pila deserves a stop because it's a traditional hamlet of Ticino where the houses are made of ancient stones, standing on a sunny green hill with a pretty view over the town of Intragna, the gateway to Centovalli. From Pila, the road descends to Intragna (339 masl). Your long walk can end in Intragna as the village is rich in hidden treasures, for example, the renowned San Gottardo church bell tower which is 65m height also the tallest tower in the Canton Ticino. Via delle Vose is a nice track about 6.5 km. From Locarno main train station, you will need to have at least 4 hours of walk, and it can be a little more if you use the public transportation to Loco and from Intragna.